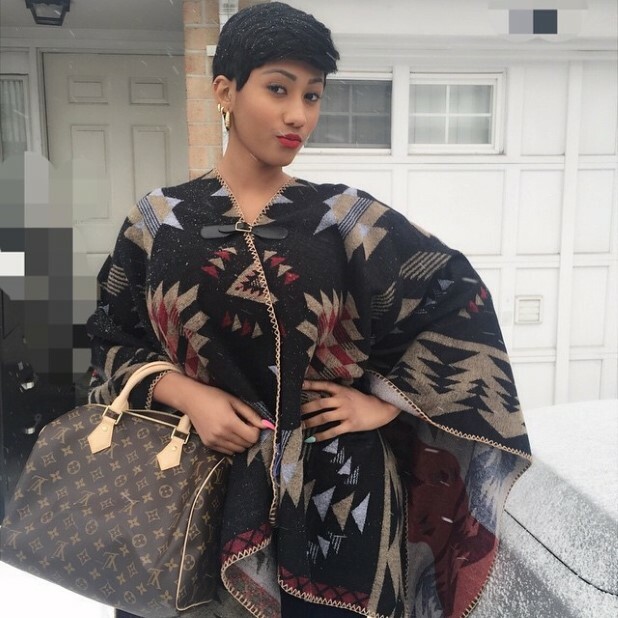 Reliable information reaching GhanaCelebrities.Com has it that, Mona aka Hajia4Real who shot to fame as the former-girlfriend of millionaire and businessman, Kenpong is currently PREGNANT —and the baby is due in a few weeks. It’s a baby girl, a source close to Mona revealed to GhanaCelebrities.Com. Of course it’s not Kenpong’s baby—and GhanaCelebrities.Com has fetched out who’s responsible for Mona’s pregnant. We mean, the man who knocked the booty so hard that she caught the ball. And we have a photo of him—which he took with Shatta Wale not long ago when Shatta visited United States. It’s a clever art of investigation; look at the photo of Mona and Shatta and also the photo of the young man and Shatta—same spot, same time. That’s the man. Apart from the fact that a baby is always a blessing—Mona’s baby will also become the next Anchor baby just as Nadia Buari’s twins. Apparently, Mona’s boyfriend is well placed too when it comes to MONEY and he is the one currently financing the seemingly lavish lifestyle Mona is flaunting on social media. It looks like some girls are blessed from God not to work or know poverty when the apples become firm—for the rich men will always find solace in their apples and beauty. Congrats to Mona; and I am expecting that call! They may be old pictures that she posts. Another reason could be that she may naturally have a small pregnant stomach and so she it is very easy for her to hide it. Yeah some people do that. Wats her name on snapchat…I wanna add her too cuz she is my role model…Pls give mi de name through…..ma email…..
And it is no surprise that Americans dislike immigrants coming into their country. People like Nadia, Hajia4real and so many other foreigners who utilize the American system solely for a citizenship or their healthcare is one of the reasons why a lot of Americans hold resentment towards foreigners who come to their country. And she, just like Nadia, Mercy Johnson and some of the Nigerian and Ghanaian entertainers, is having an anchor baby. If their unborn child’s father is a citizen then that’s a different story. But just because the father is just living in America and they have the child here, then that’s wrong. But why the US though? Congratulations my Hajia forgeti obiaaaaa ??? a child is always a blessing ????? @Ama lyn why are you so bitter towards these innocent kids? is not their fault your parents didn’t have the opportunity to do same, and at your age you are still applying for visa ?? Even Obama him self was an anchor baby. so madam relax okay because you will do the same if you were in their shoes….. Hajia congrats ???? haters will die? Well I wouldn’t as my parents came the legal way and worked many years so that they could apply for citizenship. So no, I won’t be doing the same as them and having an anchor baby ?. And it is not bitterness but simply the truth. And honestly, the majority of Americans have every right to be angry at those who solely come to America for the purpose of having their child. @Ama Lyn how sure are you is the only reason they go to America? Some of them have been going there for years now. You don’t even know their status? I just think is pure hate and jealousy. Anchor baby or no anchor baby is still a blessing. Let Americans fight for themselves madam spokesperson. Do reword your question as I am not sure what you’re trying to ask. They’re still bad as they’re playing the system. It doesn’t surprise me that many Americans are in support of all that Donald Trump has said. They’re still an anchor baby and that is what they’ll be labelled as. They’re just as bad as the Ghanaians who go to America and have their children solely for the healthcare or citizenship status. she is very active on snap chat tho so how come she is due in a few weeks. always dancing and partying. i don’t believe this news.